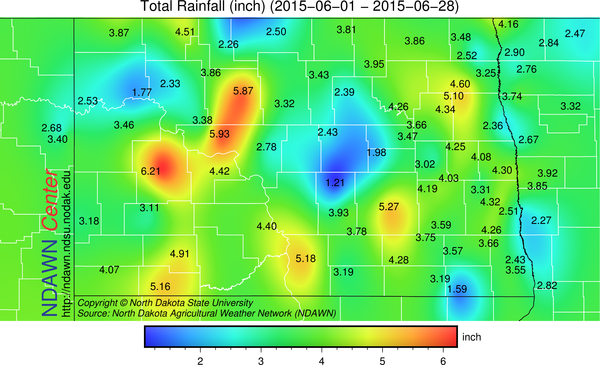 The weekend rain was mainly confined to the eastern part of North Dakota into Minnesota. 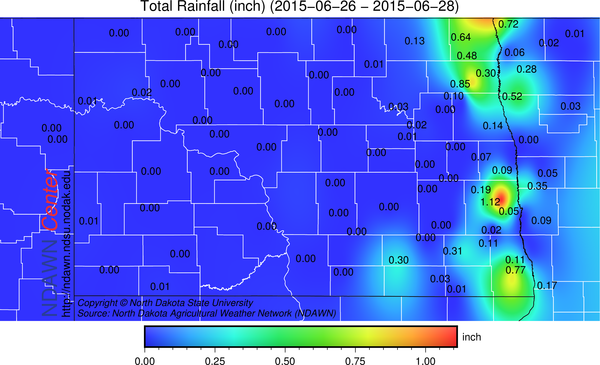 In typical thunderstorm fashion, amounts varied greatly, but over all, the higher totals were isolated. With that additional weekend rain, rain totals for the month of June are presented below. 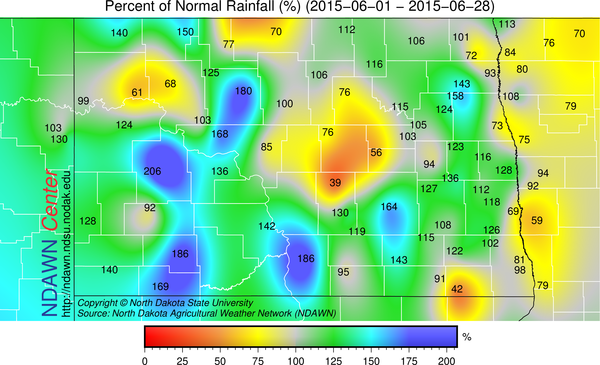 Just like the weekend, highly fluctuating totals through the North Dakota Agricultural Weather Network have been recorded during the month of June. The range has been from just over 1 inch to over 6 inches. Taken as a percent of “normal”, precipitation for June has varied from near 40% to 200% of average through the first 28 days of the month. Additional rainfall this week will come in what looks to be three disturbances coming in from Canada. There will be storms in eastern Minnesota this afternoon and evening, but the odds are it will stay east of North Dakota, meaning the first threat of rain for the state will come Tuesday into Tuesday Night, the second on Thursday and another one this upcoming Sunday. Exact timing and placement always tough, but at the moment all three (especially the first two), look very much hit and miss, fast moving, meaning overall widespread heavier rain (1″ +) would be localized. In between the storms, much of the week with have above average temperatures today start, cool down on Wednesday/Thursday, then warm back up for the weekend, then trending cooler early next week. So a lot of “bouncing” around on temperatures in the next week, with some fast moving systems from Canada.